As the train rides take longer, they get more expensive. Kandersteg is still reasonable to reach from Zurich. There is an international scouts center in Kandersteg and they are all up in the morning at 7:30. Kandersteg is known to be a shadow hole and in the morning, it does little to work against this claim. I am not the first speed hiker however. Another fine young man flies up the mountain. Although I have no problems with his speed I do keep a distance. He stops at the first mountain farm hut, drinking a coffee and talking with the farmer. So, I overpass him. There is a problem: During the week, there was bad weather and in the mountains, it snowed down to 2500 m or 1500 ft. 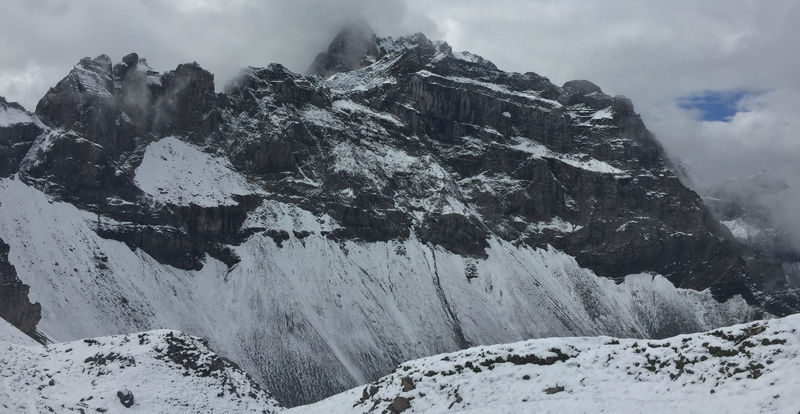 The way up to the pass, where the via alpina crosses in to the next valley, is covered in snow. I try it anyway, prepared to turn around. No crampons or micro spikes in my arsenal. They would help little. The snow is slushy and covers the ground like a foam layer they spray on the airports when something goes wrong with the landing gear. It is like soap. Less than 100 meters from the pass it went so thick that you no longer can see the ground. There are rocks and it is steep. Too dangerous for me and I turn around. On the way down, I run into the man who was in front of me. He wears boots but has no crampons either. He says, the local told him, it will be even more difficult on the other side. He attempts it anyway. I watch him go up and sure enough he passes the place where I turned without even slowing down. Good look my friend, may the snow work in your favor and the rocks be soft if you slide and fall. I don’t feel sorry to have turned. If you fall in this steep terrain you risk sliding over a rock face. I do not carry a wingsuit either. There is no flying for me today. I hike back and find a way around. This way of course leads down and then up to a higher altitude. There is no alternative to this path. If it is impassable too, I have to go back to Kandersteg and ride home. I fly down the path on the other side minus 100 m or 328 ft only to go up again 400 m or 1312 ft. The path on the other side is extremely narrow. It is down in a scree field but there is no snow. My shoes handle everything except snow. I’m not sliding anywhere. I filter water in a stream and start to hunt the scouts. They have a huge advantage because they are nearly up. They however move like turtles or in slow motion. They sometimes stand still as a group. I wonder whether they have formed a rope team. The path up again is extremely steep and because there was a small scout army just minutes ago it is all mud. The slushy snow is moving like in small avalanches. Traction becomes a problem but there are no rock faces and enough ways to stop a slide. There are so many switchbacks that you could slide for only 15 ft. The scouts are awoken enough to not cause any rock fall. I catch them just as they reach the pass. They all cheer and some of their leaders ask me questions in English. I reply in Swiss German, posing as dumb. I know nothing, never heard from the via alpina. I just deliver cheese to the next valley. I’m sorry, bye. People who wear uniforms in the mountains? I have a problem with wearing uniforms in certain conditions*. They did their daily good act by stomping the snow for me. Only their leaders have poles. It is so much easier to climb in steep terrain with them. Instead of fancy cargo trousers, they should really get poles for everybody. On the other side of this pass, there is still snow but somebody already has made footprints. Thank you very much. On the way, down to Adelboden, I meat somebody in full trail running gear. He asks me about my shoes and can’t believe that somebody knows his model. He basically wears a spiced-up version of mine. The Speedgoat 2 from Hoka one one is a pure trail running shoe while I just wear a hybrid shoe, the Challenger ATR. In Switzerland roads are common. Asphalt and gravel. If you wear a trail running shoe on roads it, will not be comfy. My shoes have their problems too. First of all, they are already destroyed because the mesh got destroyed where it flexes after 300 miles. And second they stink because their insole is thick and made of foam. It retains water or cow swamp products when they get wet. The stink guarantees you a free compartment in the train within minutes but it is not what I strive for. They will get into the bin soon. The guy I met even gave me his name so I look him up on facebook. He did 61 k, these are at least 15 k less than I did on the same day. And he even wrote on fb how much calories he used. I reach Adelboden without problems. Still a tourist destination, they have also civilian infrastructure, such as a Coop, so I don’t have to buy my resupply at an expensive shop – not that Coop would be the cheapest chain in Switzerland. I try to cut down my costs so this is a step forward. Compared to Grindelwald the tourists here did the same. Today the tourist destinations have a lot of attractions – for watching Netflix you could stay at home. Adelboden has an adventure park (some steel ropes next to a high bridge so you can do a lot of adventurous things) and obnoxious scooters everywhere. They have big wheels and mountain bike tires. Tourists get them on the mountain stations of the cable railways so they can ride them down. They try to scare hikers with them. I get my poles out after a youngster tries to touch me with his hand in full speed. The entire group behind him passes me with a lot of distance on the other side of the road. The authorities have even installed board walks in curves with a high scooter frequency. That’s why the Intelligenzija of the scooter riders happens to ride on these boardwalks. They are small compared to the road and now I scare the riders back. I do not move one inch. Most of the intellectual advanced get it in time and change back to the road. One doesn’t and he has to jump of, back towards the road. He stops and slurs at me. I just smile and turn in his direction. For reasons unknown, that seems to make him mad. He advances in my direction. I keep smiling, getting my pepper spray in one hand, both of my poles in the other. The way I get the spray (extremely elegant, I did practice it many times) sends him the right message. He steps back on his darn scooter and rides of. Hopefully, I think, he will ride it into a fat tree (with speed, I would just feel sorry for the poor tree). Unfortunately, he can’t drive into the stream right by the road as there are nets to prevent it. Little did he know about wind directions. I could not have used the spray anyways. I am not particularly sad to leave this town and all the bored adventure seekers behind me. Note to myself: Never hike in the vicinity of tourist resorts. The roads may all be paved and there may be obnoxious adventure seekers. On top of the pass there are older men flying their rc glider planes. It is relaxing, although they make a lot noise when circling above you. 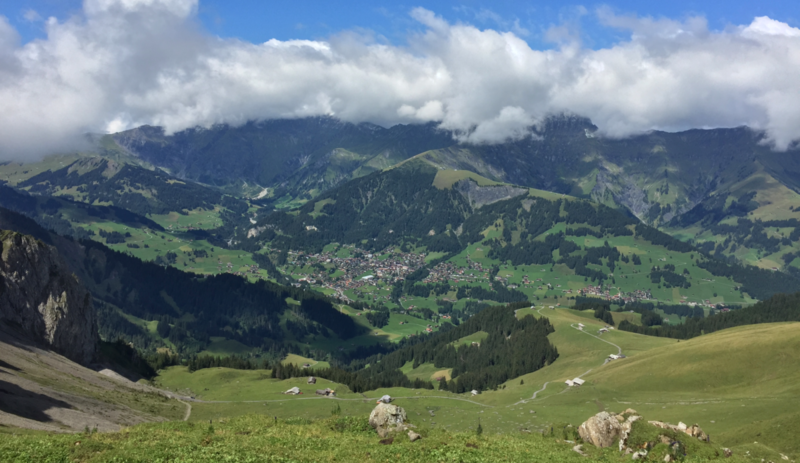 Down to Lenk. It is 19:00. I don’t want to check in at a Hotel, I want to hike and hiking is what I do. I fly up the mountain again. Lot of cow swamps and cows standing on the path. Some even advance in my direction. But they are all nice to me and they get it in time that I pose no threat and usually they munch on with their grass or whatever. They are cows, they will know what to eat in their own manure swamp. 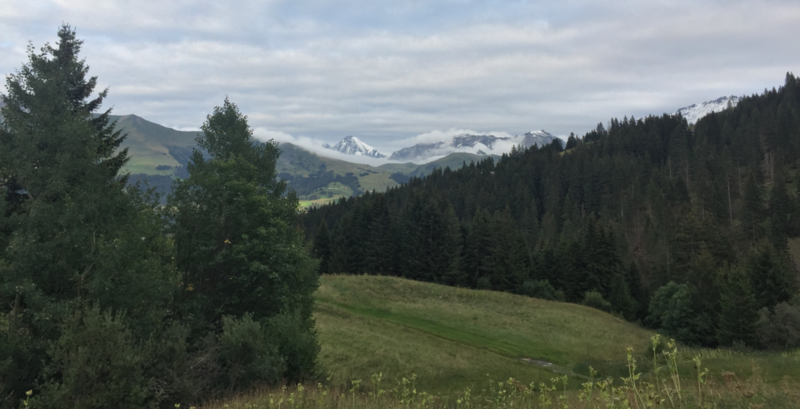 I leave the pass in direction of Gstaad. It is night now, so I have to get my lamp out. There is a house right next to the path but they have these Tibetan flags and a weed smell going. Although it seems to be a youth camp, weed is nothing for me. I just change the lamp – it is time for my 750-lumen monster from Petzl. They may have also smoked something when designing this lamp. You can adjust the light patterns with an app over Bluetooth, but you can’t just have the red light shining. I asked Petzl months ago about this function, they have not updated their app since. Maybe because the app was so successful and millions of folks waited for years to control their light with an app? Gstaad is unreal. As I advance toward the town, the landscape becomes nicer. People seem to care here. Every cow fence looks the same tidy way. I pass many structures, one seems to be a kind of community center. Although the door has no visible look I can’t open it. Next comes an open garage with a crane in it. The floor is dirty and uneven. Huge barns, everything looks like new compared to the rest of Switzerland. It is 11:00 in the afternoon, I hiked without a longer break since 7:30 in the morning. Next comes a forest hut with big tables under a roof. That’s it, I decide. I get my mat ready and I throw on some layers. Last year I hiked with less in temperatures below freezing. What can go wrong? Unfortunately, a lot. I have no dry socks so I put a space blanket over my legs. It works fine but after two hours I get cold. My rain layer works too well, so the space blanket gets wet on the inside and useless. Although I am not cold I start to shiver. Not good, I need something heated. So, it’s off with some layers and back to the trail. Thank goodness it is night I think. During the day, my anarchist instincts could flare up in surroundings like Gstaad. Nobody would like it. In Gstaad they have their own kind of mansions. They mock the traditional Swiss chalets but here the mansions are like show boats. Their owners must have invested millions in the carvings just on the outside. They put their chalets near the streets so people can see the artwork. Some of them have huge entry halls, just for the garages and the entry portals to the houses. Poor people like Gunter Sachs lived and died in Gstaad. He once organized an exhibition for a certain Andrej Warhola. At the time, nobody wanted to buy art from Mr Warhola so Mr Sachs bought one third of the exhibition for himself. Compared to some streets in Gstaad, in St. Moritz most of the people live on food stamps. In the center of the town they have everything you may need. Basic brands like Hermes, Cartier, Hublot, Moncler, Prada, Loro Piana and so on as well as some fancy art galleries. If you like it cheaper, there is still the Ralph Lauren shop. The main street is closed during the night for vehicle traffic by massive bollards who can be retracted during the day. They know why: Thieves used to drive in the shop windows with stolen cars. There are hotels, some of them with guards and dogs. They look like castles, complete with fantasy towers. Nothing for me. I spend two hours inside the railway station, where a heated passage is open during the night. Thank you Gstaad. In the morning at four, youngsters start to vandalize things on the outside. Time to leave. Apparently, my appearance deters them. My tights look somehow sporty now, nobody likes to get kicked from them. They keep a distance and I am back on the trail at 4:30. I had hoped to get some morning shoots but the mountains were not beautiful enough. All in all, I slept maybe two hours during the night and I ate next to nothing. While the sun goes up I can feel it. After some boring ski resort walking I am rewarded with the nicest trail so far on the entire via alpina. Natural surface, no asphalt or gravel. No cows on it, so no swamp. Through a wilderness area. Somebody made small stone piles, sorry for you, but leave no trace, OK? On the way down, again through gross cow swamps, I come across two thru-hikers. There is no other reason to carry such huge packs here other than if you are planning on doing many days. It’s ridiculous. I suspect them to carry weight as an additional sport within hiking. They may be British soldiers as the British army organizes training camps in Switzerland. They have the appearance of soldiers. I reach L’ Etivaz shortly before 12:00 and wash my feet, socks and shoes in a stream. L’ Etivaz is located on the Col’ de mosses. A steady stream of motorized bikers flows up and down the road. People come from entire Switzerland to drive over this pass. It is in the French speaking part of Switzerland and the train actually arrives in Montreux and follows the Lake Geneva to Lausanne on my way back. Kind of nice. Next time I will attempt to go from Gstaad all the way to Montreux. 38 miles are not much for me. It should even be doable within the time restrictions public transport gives me. The first train arrives in Gstaad at 8:51 the last useful one leaves Montreux at 23:21. In 13 hours I should be able to do this, as I did 52 in 14 and a half hours earlier. I will be done with the via alpina after this (except a short section in Liechtenstein). Maybe I will write down my ideas about this trail. * This weekend was also a huge fascist march in the US. From pictures, it appears as the fascists were allowed to march with shields, helmets and massive flag poles. A fascist idiot even drove his car into a counter demonstration, causing one woman to die. Try this in Europe, the police will come after you quicker than you may have expected. There is no way you can even get close to a demonstration with a car nowadays in Europe. Police will shoot you here, if you try.